The governing body of Viqarunnisa Noon School and College has suspended the three accused teachers over the suicide of class nine student Aritry Adhikary. Following the instruction of the Education Ministry, the governing body took the decision to suspend the three teachers including acting principal Nazneen Ferdous. The two other teachers are morning shift in-charge of Zinat Akhtar and class teacher Hasna Hena. 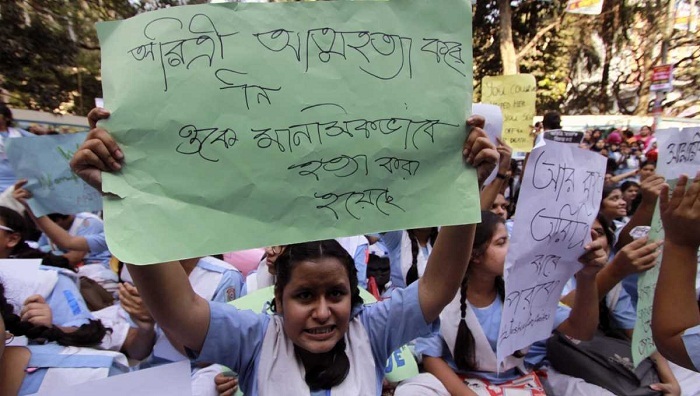 Earlier in the day, the Education Ministry sent letter to the Dhaka Education Board Chairman for taking departmental actions, including their suspension, against the teachers. Meanwhile, The Education Ministry on Wednesday sent a letter to the police and Rapid Action Battalion (Rab) directing them to take legal measures against three teachers of Viqarunnisa Noon School and College for their rude behaviour with Aritree Adhikari that prompted her to commit suicide. Besides, another letter was sent to the Director General of the Secondary and Higher Secondary Education Directorate asking it to take steps to suspend their salary and allowances.